Menara Bukit Ceylon is a freehold condominium located at Jalan Ceylon, Bukit Ceylon, Kuala Lumpur. It is developed by Tan & Tan Developments and was completed in 1993. Menara Bukit Ceylon comes with 28 storey buildings which comprises a total 88 units. The built-up size of the unit measures approximately 1,500 sf in size. All units come with 3 bedrooms. 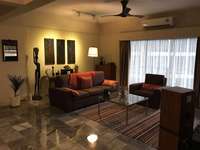 Menara Bukit Ceylon provides facilities such as squash court, swimming pool and gymnasium. Menara Bukit Ceylon is near to amenities such as shopping mall (Pavilion, KLCC, Berjaya Times Square, Low Yat Plaza, Fahrenheit 88 and Starhill Gallery), public transportation (LRT and Monorail), colleges (SEGI College), and schools (SMK Convert Bukit Nanas, SJKC Jalan Imbi, SJKC Nan Kai, SJKC Davidson, Confucian Private Secondary School and Methodist Boys' School). Accessibility wise, Menara Bukit Ceylon is easily reachable via public transportation. Get me good deal if there is any units available in Menara Bukit Ceylon.